Have you ever made muffins that weren't perfect? Maybe they were flat. Maybe the batter overflowed out of the muffin cups. They may have been burnt or under-cooked. Never again! When buying a muffin tin, select one with a dull metallic color. 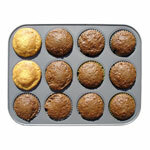 There are so-called professional muffin tins that are very heavy and nearly black in color. Darker tins absorb more heat and cooking time must be reduced - usually by 25 degrees. An average-Joe everyday muffin tin increases your chances of muffin success since the majority of reliable recipes were created in similar tins. When combining wet and dry ingredients, never over-mix the batter - 10 to 15 strokes is usually all you need. The end result of over-mixing is a course, tough texture. 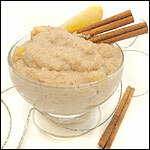 Wet and dry ingredients should be mixed separately and thoroughly before combining. For most muffin recipes, sugar is considered a wet ingredient. While it might feel wrong, it's better to have batter with a few dry spots than to have over-mixed batter. The dry pockets will have plenty of time to mingle with the liquid components in the oven. The consistency of most muffin batters should be like a less-sticky cookie batter - such that two spoons are required to get the batter into the tin. Too much liquid in the batter will create uneven muffins. 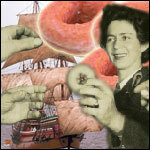 Excess liquid will bubble to the surface and play all sorts of havoc on the final product. Fill each muffin cup about 3/4 full with batter. A muffin needs room to do its thing. It's tempting to fill each cup to capacity in hopes of getting the perfect domed roof muffin top shape. But that very often results in muffins sticking together at the top of the tin and over-cooked muffin tops. 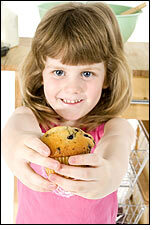 Some recipes will advise you to fill any empty muffin cups 1/3 full of water before placing the tin in the oven. This is bad advice. It's meant to prevent your muffin tin from warping. More than likely, you'll splatter yourself with intensely hot water before your cookware ever warps. If your muffin tin is warping, you have a bad muffin tin. To make larger or miniature muffins from a batter meant for standard-sized muffins: cook larger "Texas-sized" muffins a bit longer than the stated cooking time. Cook miniature muffins a bit less. Check all-sized muffins 5 minutes before the timer goes off. Many factors can effect your cooking time, including, the size of your oven, the color and thickness of your muffin tin and the consistency and color of your batter. Always place your muffin tin in the center of an oven rack positioned in the center of the oven. Muffins closer to the oven wall will cook more quickly than those in the center. Some cooks may advise you to turn your muffin tin midway through the cooking time. If there's sufficient space between your muffins and the oven wall, this is not necessary, and it's best not to disturb your muffins and cause a quick temperature flux by opening the oven door. Let finished muffins (with no toppings) cool upside down. While the muffin tin is still hot, place a dry kitchen towel over the top of the muffins and gently flip to turn the muffins out on to the counter. According to celebrity food expert Alton Brown, this will create a bit more volume as the weight shifts. If a muffin doesn't want to come out, try tapping the bottom of the tin a couple times with a spoon. If that doesn't work, try placing the bottom of the muffin tin on a wet towel for a couple minutes. When it comes to healthy ingredient substitutions, the nature of the original recipe will determine success or failure. If you try to turn a Decadent Double Chocolate Muffin into a healthy creation, you'll end up with a muffin with a split personality. On the other hand, a Banana Walnut Muffin already has an earthy, healthy character whose flavor may benefit from healthy substitutions. Experiment for the sake of health. But remember the health of the organs that makes you most happy. Ewwww. gross. 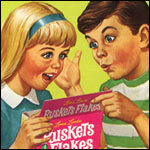 I'm talking about your taste buds. 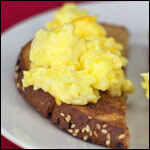 Substitute two egg whites for one egg in recipes that call for a single egg. For a lighter texture in the finished muffin, beat the egg whites until stiff peaks form and fold the egg into the combined batter. Replace up to half the flour in a recipe with whole wheat flour. This will impart a "healthy" taste and a course texture to a muffin. This replacement is only recommended for muffins with an already-healthy or rustic quality. You can replace whole milk with low-fat milk or even no-fat milk. This substitution rarely hurts the flavor of the end product. Substitute canola oil and applesauce for butter. Replace the amount of butter with 1/4 canola oil and 3/4 applesauce. (i.e. 1 cup of butter would be replaced by 1/4 cup canola oil and 3/4 cup applesauce). Substitute 1/2 of the sugar in a recipe with honey. To do this, you should reduce the liquid in the recipe (usually milk or water) 1/4 cup for each cup of honey used. You'll also want to reduce the cooking temperature 25 degrees as the honey will cause the muffin to brown sooner than sugar. 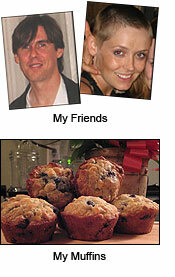 I think of muffins as my friends. I treat them as I would treat my old college roommate Spiff or my non-sexual (with me) female friend Laura. When I show affection to friends, there a subtlety involved. I don't tongue kiss my friends. I don't "dry-hump" my friends. But if my affection is expressed in a lighter more casual style, that doesn't lessen the fact that I love my friends. Or in this case, love my muffins. Love your muffins. I promise they will love you back. Start with good ingredients. If you're a little concerned your cooking oil is old, get new oil. If your flour smells a touch like the items in your pantry, get new flour. Frozen berries with ice caked on them are freezer burned. Ditch them. Don't try to get away with using second-rate ingredients. Both your friends and your muffins know when you're up to funny business. Quality ingredients make quality products. You'll find that sentence in nearly every article I've written. You'll also find it as the hidden subtext in any greeting card I've ever sent a friend. I don't hang with losers. My friends are quality people. Somewhere along the line, they picked up the right stuff. As a friend, you like to think that you contributed some of the ingredients that make your friends great. Select a good recipe and follow it as closely as possible. When using the internet to find a muffin recipe, add the word "review" to your search� ala "pumpkin spice muffins review". It's important to see what others think of a recipe before you try it. Remember: the quickest way to loose friends is to try to change them in ways they're not prepared for. Treat building block ingredients (flour, liquids, sugar, butter, oils, eggs, leaveners, etc) like your friend's body. You don't mess with your friend's guts, and you shouldn't stray far from the recipe where these ingredients are concerned. Flavor ingredients (cinnamon, vanilla, chocolate, berries, nuts, etc) are best looked at like you're friend's clothing or accessories. A new silver necklace may look wonderful with your friend's white sweater, or it may clash. It's matter of common sense and personal taste. Respect your friend's basic style and you will rarely go wrong with little gifts of added flavor. Naturally, we like to see our friends healthy. Or do we? Remember this story when it comes to muffins. When my friend Spiff got off booze, he was a better person. BUT, I could no longer take him to bars and rowdy parties. I know for a fact that I'm better off hanging out with my more sensible friend, but at what cost? So too will your muffins loose a little of their fun at the expense of healthy substitution. 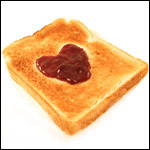 When you show affection to a lover or certain breads, anything goes. You get your hands in there; you're excited, sometimes even spastic. And that's okay. But for a friend, there's more decorum. When the time comes to mix the dry ingredients with the wet ingredients of your muffin batter, relax. Ten to twelve stir/fold stokes is all you really need. 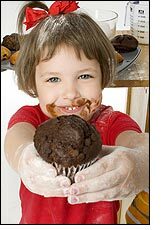 When flour mixes with liquid, gluten results and if too much gluten forms, you're muffin will be tough and chewy. Imagine showing too much affection to a friend. It would throw them off. In essence, they would get tough and build a defense toward your overpowering advance. In these cases, there are only two possible outcomes: 1) You loose a friend; or 2) You throw caution to the wind, dollop the batter into loaf pan and make a hearty quick bread from your muffin batter. The cooking time for a muffin recipe is a relative thing. If the recipe states "25 minutes", read that as "20 to 30 minutes". Factors such as batter consistency, oven size and placement of the tin within the oven can all effect the cooking time. Five minutes before you expect your muffins to be done, puncture one of the muffins in the center with a toothpick. If it comes out free of batter, your muffins are done. Take them out of the oven... you just saved them from burning. The friendship moral: If you suspect your friends are in hot water or feeling burnt out, ask them about it. Do all you can to pull them out of life's proverbial oven and put them someplace cool (like a trendy coffee shop or a hip bar). When I'm about to hang out with my friends, I get excited about it. The anticipation of having fun is fun in itself. The fact is that most muffins taste best after they've set out for a couple hours after baking. They have a chance to relax and the flavors meld and become smoother. As much as you want to slather butter on a warm muffin, resist the temptation. Take an hour and look forward to it. I promise it'll taste that much better for your patience. Lastly, make the time you spend with your friends and muffins quality time. It's fun to rush around with your muffins and friends, but you really get the true flavor of your friends in quieter more contemplative moments. Take the time to focus on your friends and muffins. Make some coffee. Put out jam and softened butter. Each one of us inside himself can appetise the dream." Here they are. Come and get 'em! Remember from Lesson 4 Subsection 2 to check the reviews at the bottom of the recipes. In nearly every aspect of life, someone has already made the mistakes. Learn from them and you will always have muffin success. Good luck out there. Did you read the entire article? Really? Okay. Congratulations! 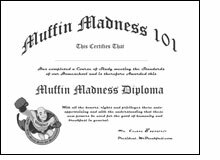 You passed Muffin Madness 101. 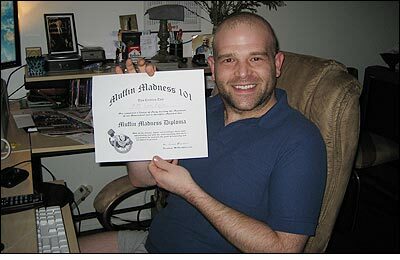 "I earned my diploma in under 20 minutes. Thanks Mr Breakfast!"